Tags: Banarsi Chiffon, Bright Red, Churidar Pajama, Ferozi. Ferozi janawar shirt has been embellished with embroidered neckline and heavy red appliqued border embellished on hemline.Embellishment work includes tilla, kora, dabka, crystal ,beads, sequins and stone etc. Beautiful ornamental motif implemented under neckline. Half sleeves finished with red piping. 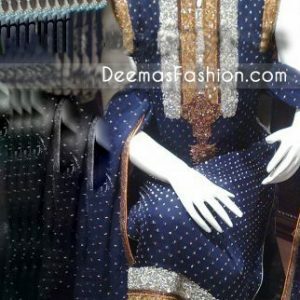 Ferosi banarsi jamawar churidar pajama fully elastic waist. Red crinkle jamawar dupatta have embellishment at borders and finished with ferozi piping.